^ Maltese naitionals as referred tae in the 2011 census. ^ Maltese lira afore 2008. ^ An aa .eu, shared wi ither European Union member states. Coordinates: 35°53′N 14°30′E﻿ / ﻿35.883°N 14.500°E﻿ / 35.883; 14.500 Maltae, kent offeecially as the Republic o Maltae (Maltese: Ir-Repubblika ta' Malta) is a wee island naition in the mids o the Mediterranian Sea. It lies sooth o Sicily, tae the east o Tunisie an north o Libie. The kintra's offeecial leids is Maltese an Inglis. Roman Catholicism is the maist muckle releegion on the island. The kintra o Maltae haes chynged haunds monie times ower the years. It haes been aucht the Knights o St. John, the French an syne the Breetish afore becomin independent in 1964 an a republic in 1974. Maltae is the ae kintra in the hale warld that haes been awairdit the George Cross for its ettles durin WWII. It haes a replica o the George Cross on it banner. Syne 2004 it haes been pairt o the European Union an in 2008 it teuk up the Euro. 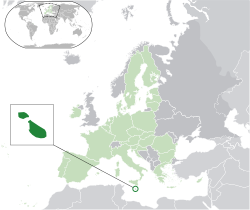 ↑ "Maltese sign language to be recognized as an official language of Malta". The Malta Independent. ↑ Zammit, Andre (1986). "Valletta and the system of human settlements in the Maltese Islands". Ekistics. Athens Center of Ekistics. 53 (316/317): 89–95. JSTOR 43620704. ↑ 5.0 5.1 5.2 5.3 "Malta". International Monetary Fund. ↑ Lesley, Anne Rose (15 April 2009). Frommer's Malta and Gozo Day by Day. John Wiley & Sons. p. 139. ISBN 0470746106.